As part of the Historical Records Survey, WPA staff created indexes of historical records across the country, fostering today's interest in genealogy and history. If you have surfed the Internet for genealogical records, chances are you have run across a site or two that published "WPA Cemetery Indexes". The WPA is now long gone, but their legacy lives on in the genealogical community. What was the WPA, what did they do, and what happened to them? When the Great Depression hit the United States in 1929, the American economy hit rock bottom. The value of the dollar became nearly worthless and millions of Americans lost their jobs. In 1933, President Franklin D. Roosevelt introduced "The New Deal", a series of new programs designed to pick America back up on to its feet and get the economy moving again. 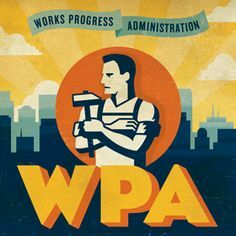 The Works Progress Administration (WPA) was one of those programs. Initially designed to fund the building and improvement America's infrastructure, it also funded the arts, history, and culture of America. In short, the WPA employed out-of-work Americans who were certified by local agencies as meeting certain qualifications. The WPA was born in 1935 with an initial appropriation of $4.88 billion dollars from the Emergency Relief Fund. Over the years, the WPA would employ some 8.5 million Americans, and spent a total of $11 billion dollars. Interestingly, half of those workers were employed in New York City alone!. Typical WPA workers were paid $15 to $90 dollars a month. It remains today as the most vigorous attempt in history to stimulate the U.S. economy. In 1939, the WPA was renamed to the Works Projects Administration. The WPA lived for only eight years. The WPA was responsible for building structures, such as airports, seaports, and bridges. It paved 651,000 miles of road, built 78,000 bridges, 8,000 parks, and 800 airports. The WPA also funded some programs in the humanities, including the Federal Arts Project, Federal Writers Project, Federal Theatre Project, National Health Survey, and the Historical Records Survey (HRS). WPA staff indexing the 1920 U.S. census. Source: National Archives and Records Administration. Originally organized in 1935 as part of the Federal Writers Project, the HRS documented resources for research into American History. It later became a unit of the Research and Records Program in 1939. The HRS was responsible for creating the soundex indexes of the federal census which genealogists today have come to rely so heavily on. The HRS also compiled indexes of vital statistics, cemetery interments, school records, military records, maps, newspapers, and the list went on and on. Microfilms of these indexes were later made by other organizations. Click here to see an example of a cemetery survey created by the WPA. The WPA was organized into regional, state, and local divisions. Much of the work conducted by the HRS was done for the National Archives and Records Administration (NARA), as well as state archives agencies, and state historical societies, which these entities are still in possession of. One can access the microfilms by paying a visit to these organizations. As the years went by, government officials became highly critical of the WPA, arguing that money was being spent to fund projects that people did not need, such as tap dancing lessons, and murals painted in post offices. Roosevelt claimed the high morale of the workers was well worth the money. However, federal funding for the WPA decreased over the years, and certain projects were terminated. WPA staff began waging labor strikes, which only fueled arguments against the WPA. When the United States entered World War II in 1941, Americans went to work building war machines. Hundreds of defense contractors earned orders, which spurned the growth of yet thousands of more companies. By 1943, it was clear that the WPA had run its course. Roosevelt signed the order terminating the WPA, which ended on June 30, 1943. After the WPA was dissolved, the records, now in the hands of state archives and historical societies, were microfilmed, indexed, and made available for use. However, many other records were placed into boxes and stored away. Fewer yet had been destroyed, and in some cases, destroyed purposely. With the emergence of the Internet, WPA records have found their way into mass distribution. Genealogists, who have long relied on microfilms of WPA records, are now finding the same records online. The most prominent example is the USGenWeb Census Project, where volunteers are migrating the census index microfilms to the Internet. Many WPA cemetery recordings are also finding their way online. While no single WPA based project currently exists, hundreds of people across the United States have visited their local historical societies, copied some records, and published them to the Internet on their own personal websites. While critics might argue that federal money was wasted on unnecessary projects, it is clear that the work of the WPA fostered a greater appreciation for the arts and humanities. The thousands of publicly accessible paintings, writings, plays, and music, stimulated the people's appreciation of the arts. The thousands of parks and recreational facilities built by the WPA, is the reason why we have become used to having so many parks and facilities nearby. Likewise, the projects of the HRS created interest in the research of history and genealogy, which subsequently spurned the restoration of old cemeteries, erection of monuments, and establishment of societies and clubs. Interest in genealogy would not be at the level it is now if not for the WPA. Steve is the editor of The Cemetery Column, and is the webmaster of Cemetery Records Online.